What is this you may ask? Let me tell you. 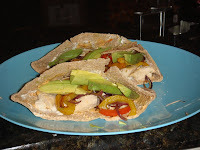 They are Mediterranean chicken pitas and very easy to make. -Cut bell peppers and purple onions. Toss in olive oil and oregano. Broil veggies in oven at 400 for 15-20 minutes. (Cover bottom of cookie sheet in foil for easy clean up.) Cook chicken in skillet. Use tazhiki (don't know how to spell that, but is a yogurt type dip) and hummus as condiments in your wheat pitas. Sprinkle with goat or feta cheese and get yo grub on...so GOOD! And easy, and healthy!! I need an apron too, but I never know where to buy a cute one! That might be for dinner very soon at our house. Yum. And darling apron. I think Yosh should take a hint from the marinade and call you Goddess while you're in the apron. is this what you made that one time we were over for the byu game? i am glad you posted b/c i have been meaning to ask you for the recipe. 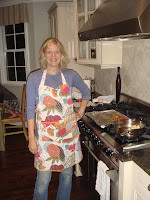 Love the apron--everyone needs a cute apron.